This is Part 2. Here's Part 1 and here's Part 3. In my first post on Real Food Sports Nutrition last month, I shared that my history of sports and recreation, alongside my current real food dietary lifestyle, have caused me to rethink sports nutrition. I've come to the conclusion that for the recreational athlete, it is possible to fuel and hydrate using real, unprocessed foods. In today's follow-up post, Part 2 of our 3-part series, I present you with some options for hydrating your recreational family using real food. So, here we go! Our society completely overhypes the need for processed, synthetic, dyed, plastic-bottled drinks to be used during bouts of physical exertion. There is no magic sports drink. Well, wait. There is one — water! God gave us water for a reason. Unless we are exercising hard for an hour or more, are contending with beyond-normal weather conditions, or have medical conditions that require electrolyte replacement, water should be more than adequate. There are those times of excess exertion. But frankly, there are other times we come inside from an easy thirty minute run and just want something more than water. Take the case of our sporty children. Even after three sprint-distance swim events, they understandably crave a refreshing beyond-water drink while sitting in the extremely humid, hot mid-Atlantic sun, watching their teammates swim. What should, or can, we drink if we aren't going to gulp down a purchased sports drink? An appropriate question would thus be . . .
What Do We Want In a Sports Drink? Sports drinks typically contain a source of glucose for energy, a bit of salt — as well as calcium, magnesium and potassium — for electrolyte replacement, a tasty flavor and a whole lot of water. Really, it's that simple. You can make it yourself, store it easily, bring it to recreational events, and feel good about what your family drinks. 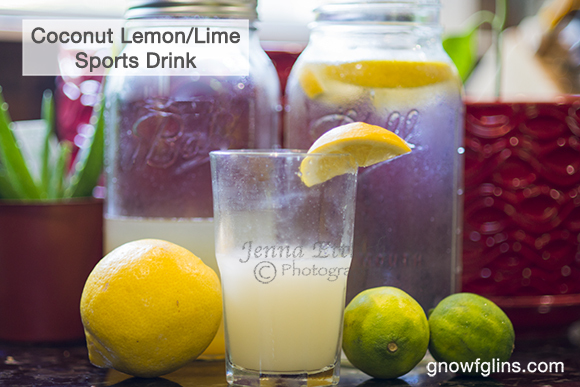 Here are two delicious and simple recipes for homemade sports drinks. The first uses herbal tea as the base, and the second uses coconut water. Think about your favorite decaffeinated, herbal tea. We love Red Rooibos Tea. If you simply add some real food sweetener of choice (like raw honey, unheated) and a pinch or two of unrefined sea salt, you have yourself the beginnings of a wonderfully healthy, refreshing sports drink. Our opinion is that it tastes much better than what you buy at the store! Make just under a gallon of herbal tea of your choice. When the tea is cooled (not quite to room temperature), add the honey and stir until dissolved. Also add your mint (or other herb) leaves. Here, some people may choose to dissolve a few simple calcium-magnesium-potassium capsules so as to add a bit more electrolyte (however, you could also dissolve a half-capsule into an individual serving size bottle of this drink, right before the sports event). Next, slice lemons into half circles or small circles. When the tea is cooled to room temperature, add the lemons, squeezing slightly when placing in the tea. Pour in salt and stir. 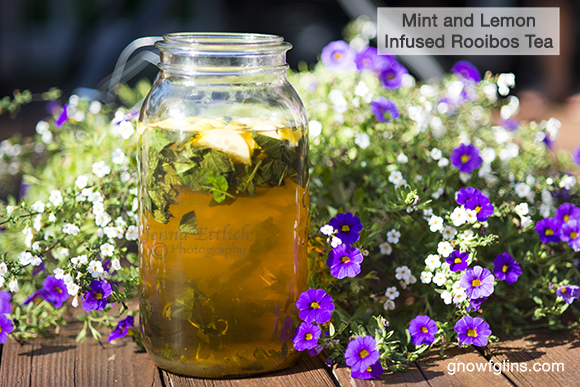 Let sit for a few hours while the mint and lemon infuse mildly into your tea. Refrigerate. Now you're ready with a sports drink! Coconut is a wonderful base for a real food sports drink. It naturally contains potassium, vitamins, enzymes and amino acids, so does not necessitate adding additional electrolytes beyond sea salt. Here's more information about the benefits of coconut water, plus how to ferment it. As canned coconut milk sits on your shelf, it often separates into thick cream (on the top) and a lighter, thin, watery-looking milk on the bottom. If you do not find this to be the case, place a can in the refrigerator overnight and the separation should occur. Gently scoop out the cream and place in a container for future use (I use this coconut cream in a curry dish, or to whip up as whipped cream for dessert). Measure out about 1/4 cup of the watery coconut milk left in the can. (If using homemade coconut milk, use the thinnest, least grainy portion of your milk.) Place in a quart-sized container. Add the salt, honey and citrus juices. Finally, add enough water to fill the final product to about an inch below the top. If you're about to head out the door — add a couple handfuls of ice cubes to make it cold and keep it fresh. If not, place in the refrigerator. Shake up product before drinking. It is refreshing and healthy, yum! What If You Don't Have Time? If you don't have time to make your own sports drinks, you can always buy containers of pure young coconut water at health food stores and store it in your pantry for an emergency. Pour this into a quart-size container (acting as the coconut milk AND the water in my above recipe), and simply add the salt, honey and lemon/lime. Find brand recommendations and buying guide for coconut water here. Another option is to have powdered coconut water on hand, hydrate as per the directions, then add the other ingredients listed here. If you're really pinched for time, a container of pure young coconut water all by itself is still much healthier than many traditional sports drinks sold at the store. You see, Ladies and Gentlemen, it IS possible to keep hydrated during sports and recreation using real foods. In my upcoming 3rd of three posts on Real Food Sports Nutrition, I'll provide snack ideas and recipes for your recreational family's energy needs. Stay tuned for that, next month! 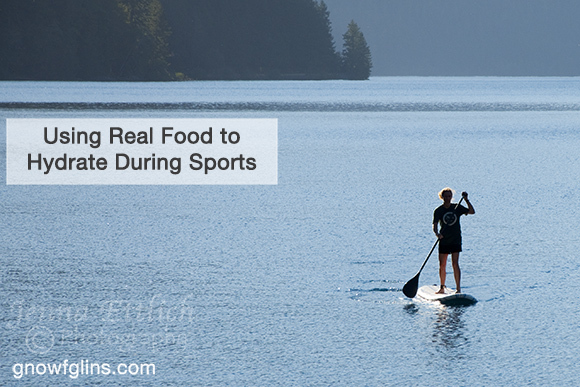 Do you have any special real food drinks you use for hydrating your family during sports and recreation? I'd love to hear your ideas. Please let me know how these recipes work for you! 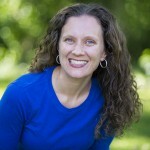 Jenna is a homeschooling, whole-foods eating, nature-loving Christian, married to her supportive active-duty Navy husband. She spends her days living and learning right alongside their five vivacious children. Jenna has spent the last decade interested in whole foods and the way food affects behavior, mood, health, medical outcomes and family culture. She enjoys photography, music, outdoor recreation, travel and living as simply as military life will allow. Jenna holds an M.A. in Communication and currently resides in Virginia. Thanks for the great ideas and recommendations! With (home)school and P.E. beginning, I’m excited to try the coconut lemon/lime mix to help beat this incredible SoCal heat wave we’ve got going on right now! An hour *sitting in the shade* of this and I’m ready for something other than water! 😉 Will let you know how it turns out! PS – Beautiful photos, by the way! Thanks for your comments, Bethany. It’s nice to hear from you! I hope your experimenting with the coconut lemon/lime drink goes well. Let me know! Thanks, Jenna! Can’t wait to try this at soccer! The coconut/lime one was great – the kids loved it! I have plans to make 2 batches next time, one for drinking and one for popsicles! Maybe even making the “concentrate” and freezing in ice-cube trays to be added to water bottles later for quick out-the-door moments. Lots of possibilities here… thanks for the inspiration! I make my own electrolyte drink for my kids too. It’s just fresh orange and lemon juice with a pinch of salt, a bit of raw honey and 2 cups of water. Super easy and keeps my little ones hydrated.